What is the complete truth and/or what is more helpful? Not only have I been guilty of it, I’ve heard them come out of the mouths of some of the most incredible people I’ve ever met. You know what’s even more surprising? We believe it. Hook. Line. And sinker. We own those stories. With life coaching, and most especially in counseling, we explore this concept of acceptance - and what to hold onto and what to let go of. Acceptance is something we all can probably do a better job of EXCEPT when it involves accepting a story that just isn’t true...or helpful. And by helpful I mean in helping us live the kind of lives we want to live - one we value. 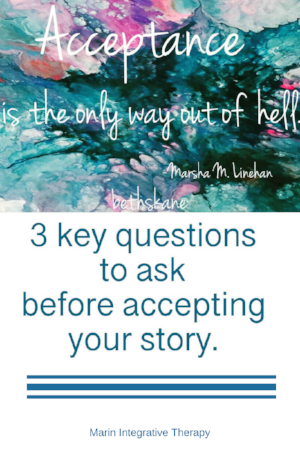 The next time you find yourself telling yourself this kind of story, I’d like to ask you to ask yourself these 3 questions. Is your story true? Absolutely 100% true? Is it helpful to you? Isn't it time to change the stories that keep you stuck?